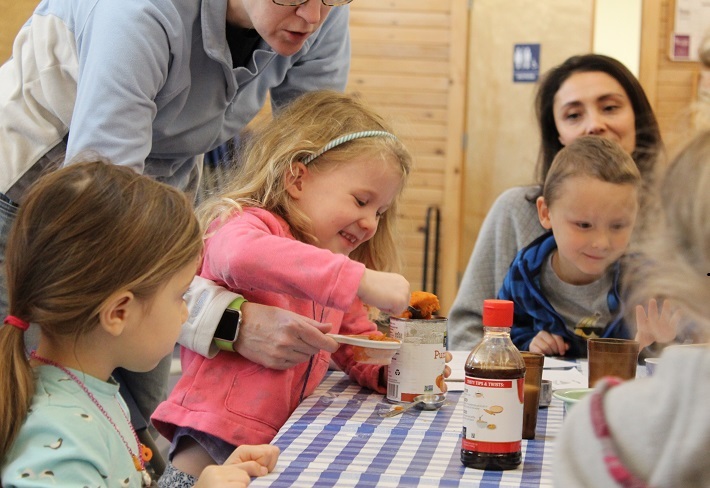 Posted on November 20, 2018 by Kelly M.
The leaves are sparse, the chilling air has set in, and the Drumlin Farm Cooking Together class is preparing to make Drumlin Farm’s seasonal favorite, pumpkin waffles with homemade butter and apple cider syrup. 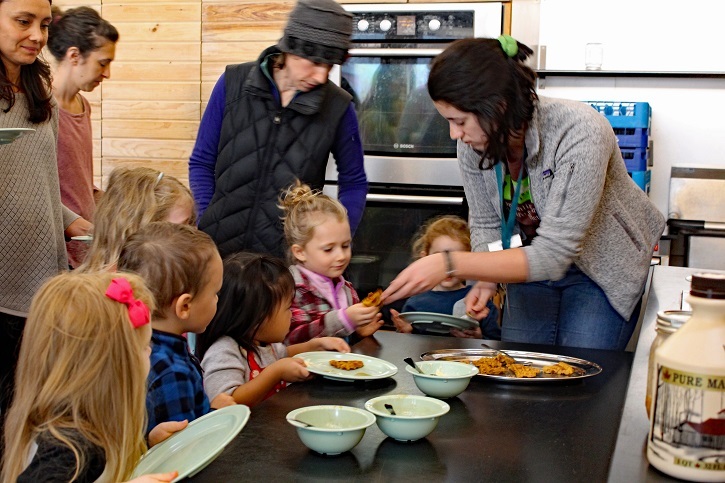 Every week, this class of 3-5 year olds and their parents learn, and enjoy, a new recipe together. Perfect for a fall weekend breakfast, this simple recipe uses a combination of seasonal spices and homemade ingredients to create a meal that you’ll keep coming back for seconds…and thirds…and maybe fourths if there’s enough! Add dry ingredients to a large bowl and whisk to combine. If you’d like to follow along the “Cooking Together” way, feel free to sing a “mixing, mixing, mixing” song along with it. In a separate large bowl, add wet ingredients and mix together until smooth. Add dry ingredients to wet ingredients, mixing until combined. 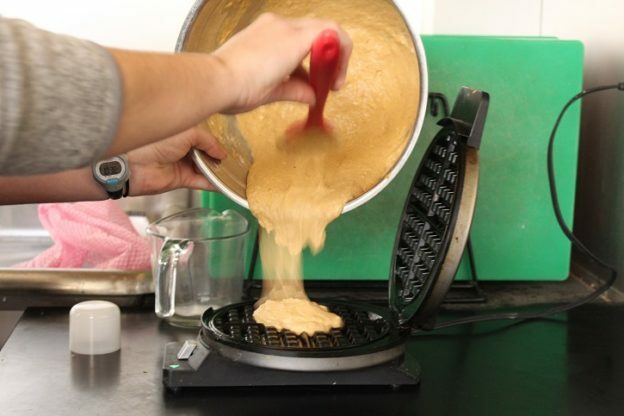 Spray waffle iron with nonstick cooking spray, scoop mixture onto iron, and cook about 3-4 minutes. 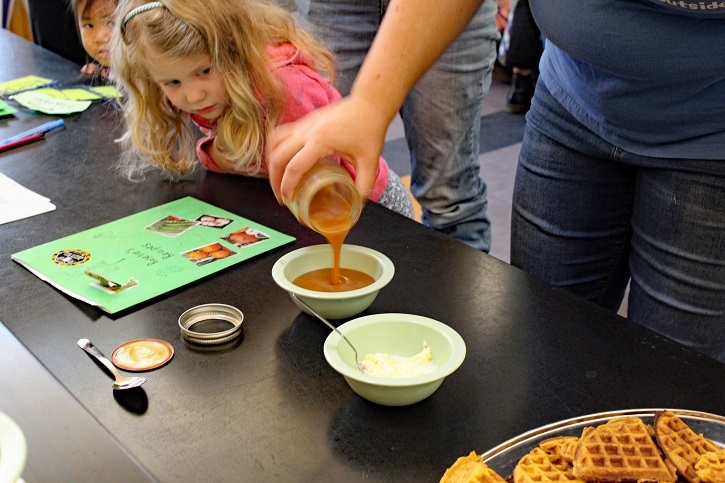 While the waffles were cooking, families gathered around circle time to take turns continuously shaking 1 cup of heavy cream in a mason jar until a solid formed, and we had homemade butter. 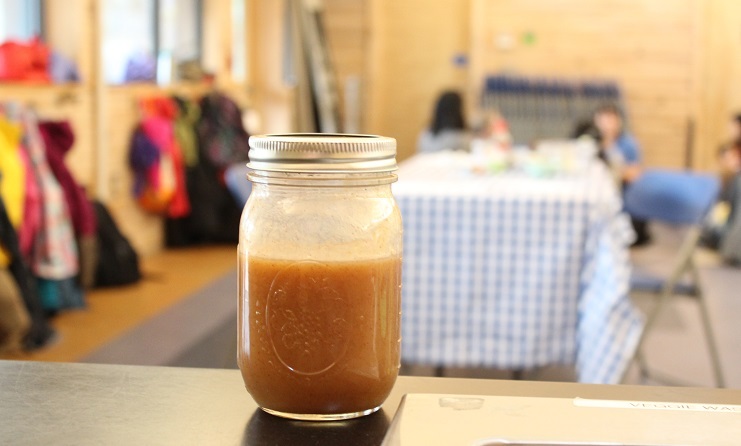 Our Teachers prepped the serving station with another Drumlin Farm recipe favorite–apple cider syrup. To make the syrup, stir together the sugar, cornstarch, and cinnamon in a saucepan. Stir in the apple cider and lemon juice and cook over medium heat until mixture begins to boil. Boil until the syrup thickens. Remove from heat and stir in the butter until melted. Serve warm. And voila! 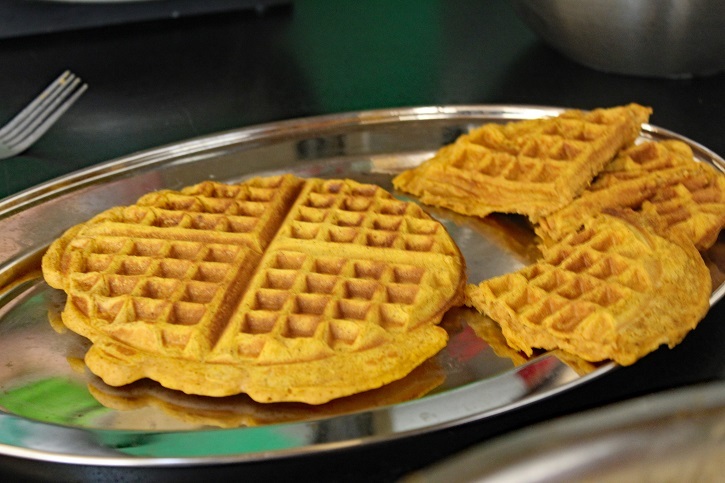 When the waffles are done cooking you’ll have a deliciously cozy fall favorite. Adorn your own waffle station with the favorite fixings of your choosing and enjoy a breakfast with family, made with love. Take it from our class, you’re going to want to make enough for second–and thirds! 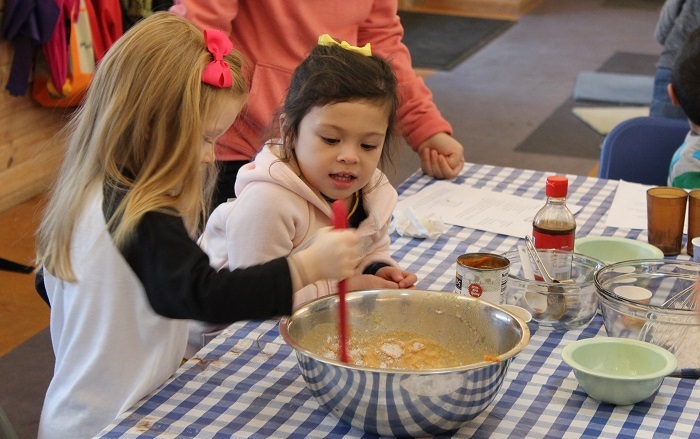 Registration is now open for our next series of Cooking Together classes, starting January 22! Lining back up for another helping! 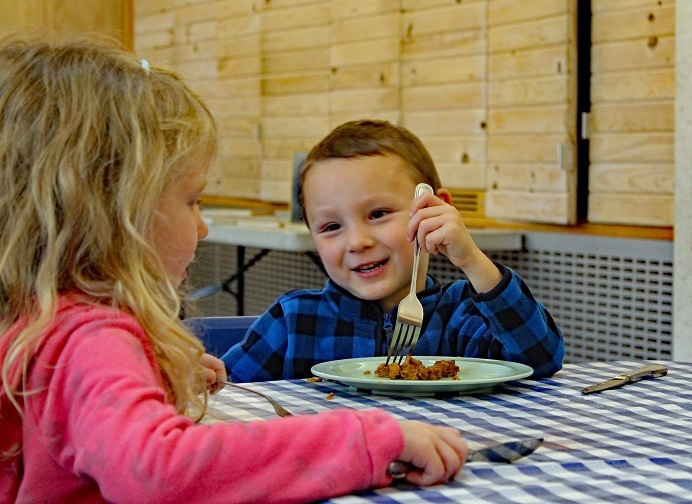 The best breakfasts are the ones eaten together with a smile! 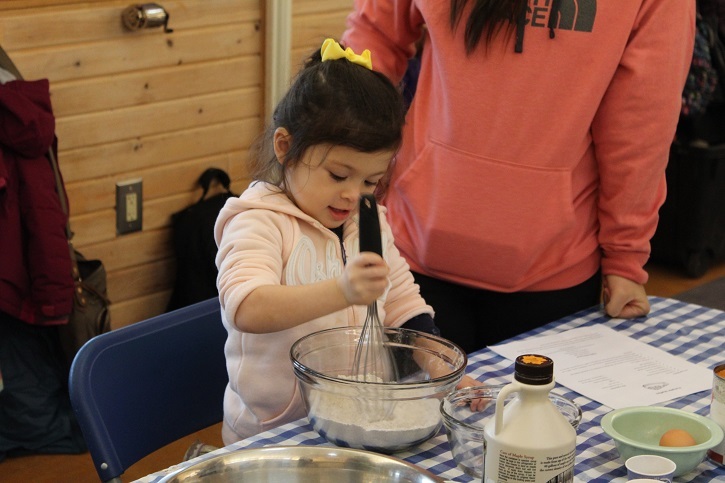 This entry was posted in Education, Programs and tagged cooking, cooking together, family programs, know your food, pumpkin, series, waffles on November 20, 2018 by Kelly M..